Gummy rats, Chewy fruit flavored gummy rats in treat size packages. 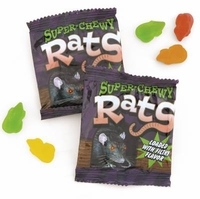 Each pack has bite size gummy rats in apple, cherry, orange and lemon flavors. These are perfect for kids of all ages as everyone loves gummy candy. You get 18 snack size packs, 8 gummy rats in each pack.